What's New for QuickBooks 2017? The Customer Type and Vendor Type filters help you find customers and vendors faster. Customer Center: In the Customer Center, click the magnifying glass under the Customer and Jobs tab and from the in drop-down, select Customer Type. 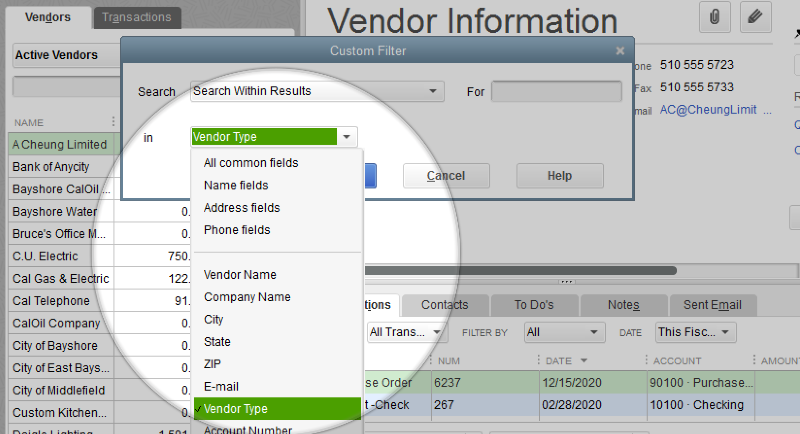 Vendor Center: In the Vendor Center, click the magnifying glass under the Vendor tab and from the in drop-down, select Vendor Type. Search As You Type is an enhancement to the Type Ahead search feature in transaction forms. This enhancement lets you find item/account names that not only start with the typed characters but are also in the beginning of any word in the Item/Account name. From the QuickBooks Edit menu, go to Preferences. On the left pane, choose General then click the My Preferences tab. Put a checkmark on the Automatically open drop-down lists when typing box. With this feature, QuickBooks Desktop looks at the first few letters of a word. For instance, if you type “A1 Customer Storage Shed,” QuickBooks will find matches to A1, Customer, Storage or Shed. Note that a space must be included in order for QuickBooks to recognize a word. If you have “A1CustomerStorage Shed” you will only come up with matches for A1 or Shed and not for Customer or Storage. When matches are found using the first word as the search, you are able to use the down arrow to go through the list; however when searching using a second word and no first word items match, then you will not be able to use the arrow, it will stay on "Add New". QuickBooks Desktop 2017 offers smoother experience to switch to single-user mode, with insight into who is still logged in and a real-time chat option to coordinate with users. Here are some of the new and exciting features available in the improved multi-user mode. The user sees who is still currently logged in when he tries to switch to single-user mode. The Admin user can set a timer while waiting for single user mode. They can give other users up to 10 minutes. This feature can be utilized by all users. When the timer runs out, the Admin is given the option to either cancel the switch to single-user mode or close the file for logged-in users. Non-Admin users, however, cannot close the file on their co-workers. Other users can see when the admin gives them a time limit to save their information and log out. From the QuickBooks Edit menu, click Find (or you can press Ctrl+F on your keyboard). Go to the Advanced tab and from the Filter list, select Amount. In the From and To fields, enter the amount range then click Find. The results will populate all transactions falling between the amount range you entered. Note that you can also use Find when searching for in-between amounts while you are in the Customer Center, Vendor Center or Report Center. From the QuickBooks Edit menu, click Search (or you can press F3 on your keyboard). Click the drop-down under the Amount section then select Range. In the From and To fields, enter the amount range then click Go. The results will populate all transactions falling between the amount range you entered. 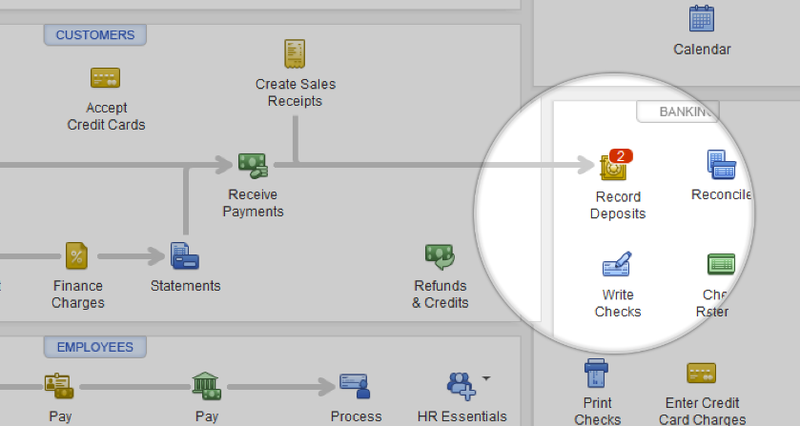 You can choose to show results from Transactions, Customers, Vendors, Accounts, Items, Employees and Others. You can also select a specific date range. On a report, click the Customize Report button. In the Modify Report window, go to the Filters tab. From the Filter list, select Amount. In the From and To fields, enter the amount range then click OK. The Report will now populate only transactions falling between the input range. Multi-currency has limited functionality: The feature only searches in the total field for the home currency but shows your results in the foreign currency. 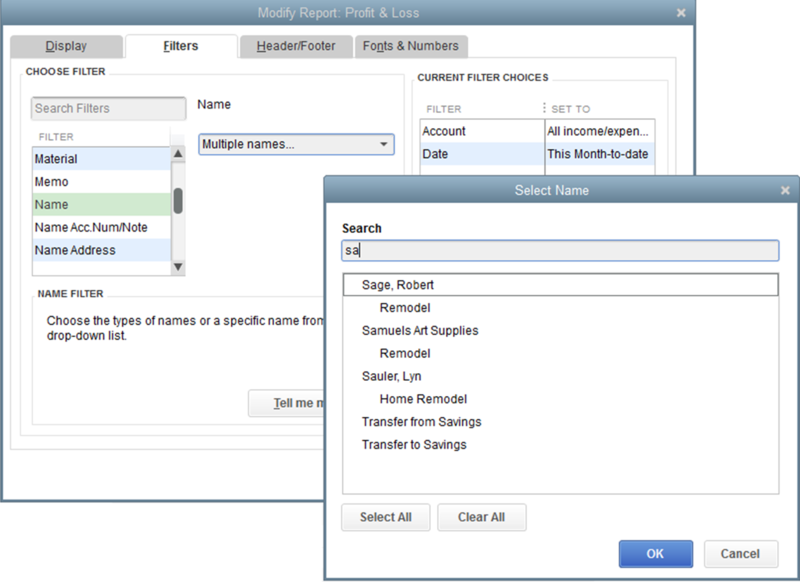 Cash basis reports are excluded from this feature: The In-between amount search only looks for accrual basis amounts. You can quickly view all applied filters on a report. 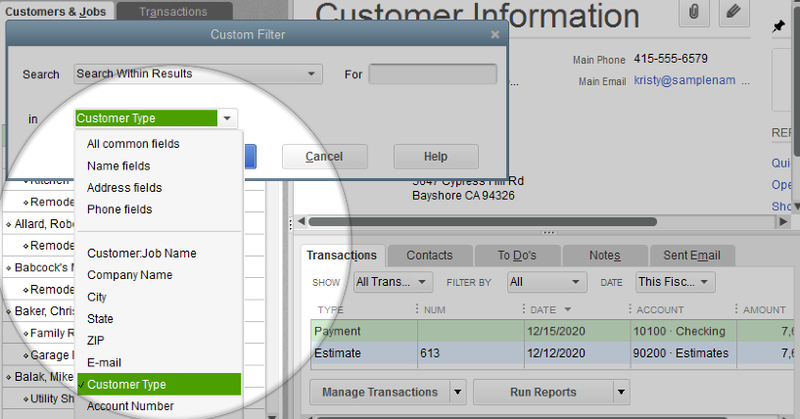 Just click the Show button and QuickBooks will display all of your filters. You can also print off the applied filters. Just set the Applied Filters to Show and your filters will be included on the last page of the report. Now you can see users that you have deleted on all reports by username. You would no longer see "unknown" as the user. This is only for version 2017 forward. This displays users in the reports even if they were deleted prior to 2017, going back to 2014. QuickBooks Desktop 2017 has vastly improved the selection of multiple names for filters on reports. 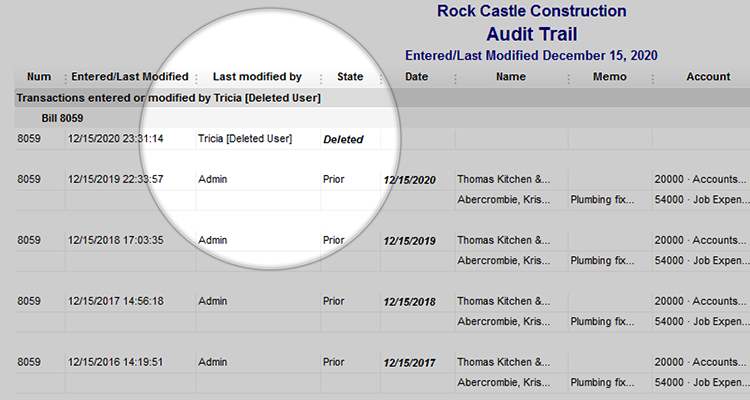 Filters that allow you to select multiple names, such as Customer, Item, Vendor, or Account filter, have an improved user interface. This allows you to easily select or de-select all names and find individual names. In QuickBooks 2017, you can see if you have a payment waiting for deposit with a red notification in the Banking section of your QuickBooks Home screen. Scheduled Reports is a feature that allows you to send reports on a regular and recurring scheduled time. This only works in a local Multi-User setup, not in Citrix or hosted environments, including Right Networks. Only one company file can be open at the scheduled time of the report. If Outlook is your email method then Outlook needs to remain open. Make sure your computer is not in sleep mode, hibernation, or turned off. The first scheduled report must be set up by the Windows Administrator. Windows Server 2008 R2 SP1, 2011, 2012 R2. Important: Windows Server 2011 is only supported with QuickBooks Desktop 2017 R4 and above and QuickBooks Desktop Enterprise 17.0 R4 and above. Microsoft Word and Excel integration requires Office 2007, 2010, 2013, 2016 or Office 365 (32 and 64 bit). Note: Office 365 is only supported when it is locally installed, not the web version. E-mail Estimates, Invoices and other forms with Microsoft Outlook 2007-2013, Microsoft Outlook with Office 365, Windows Mail, Gmail™, Yahoo! Mail®, and Hotmail®.